Janet O. Hagberg has written a dynamic book about power -real, personal power- for forward-looking people and organizations who want to harness their own power for the common good. 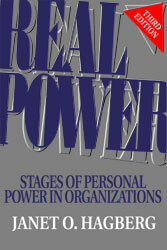 "I wrote this book," says Hagberg, "to transform the way we think about power and leadership. It takes people on a journey beyond achievement and sucess to a stance in which power comes from their inner core and they lead from their souls." There is no doubt that the world is ready for a new model of leadership. In this third edition, Janet Hagberg addresses much that she has learned from her readers. The result is a deepening of the descriptions of each stage, a new way to think about the dark side of each stage, new stories of each stage derived from her readers, a connection to the spirituality expressed at each stage, as well a description of "The Wall" between Stages Four and Five. Throughout the book, the author adds more of her personal story to illustrate her experiences and observations of each of the stages of power. Janet O. Hagberg is an author, public speaker, spiritual director, and social activist. She has written seven books including The Inventurers, Real Power, Wrestling with Your Angels, and The Critical Journey. She is currently the Executive Director of The Silent Witness Initiative. This organization's goal is to eliminate domestic violence homicides by the year 2010. I believe individuals and organizations are more receptive than ever to the ideas in Real Power and to true leadership. The pace of change and the pressure on organizations to find ways to innovate are stronger, and it will take leaders of immense courage, who operate beyond the cultural norms to move us into the twenty-first century. Introduction: What Is This Book About?